Comments: Listed by Fuld as WA.1795. 7 and by Breen as 1295. This is the more common copper variety with a plain edge. According to Breen's classification this is the small thin planchet variety or, as Cobwright states, a flat rim planchet. The example was PCGS graded as VF25 and has been removed from its slab casing. On the obverse note the misspelling of GEORGEIVS. Also, the H in the legend is made from two I punches with a crossbar scratched into the die, however on the reverse an H punch was used. 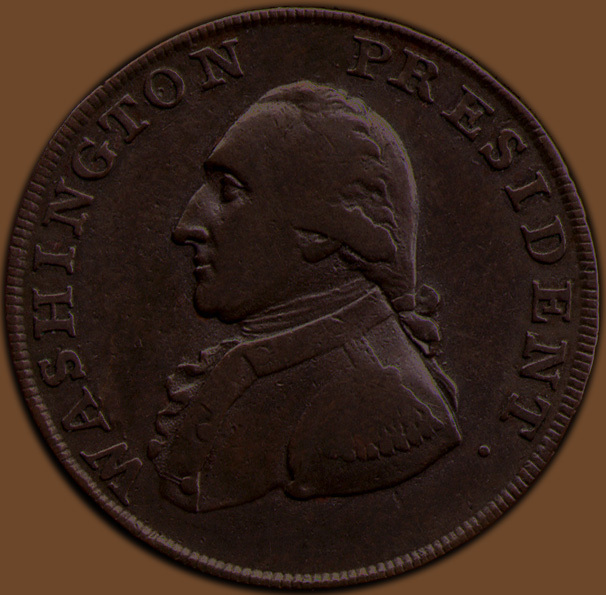 Numerous obverse die cracks are visible: a major crack can be seen from the second E in GEORGEIVS running down toward the bust with a portion below Washington's chin, also a small crack can be seen as a dot under the first G. Additionally on this example there is a lamination flaw at the ON. Possibly the line running from the first stroke of that N to the bust is another die crack rather than part of the lamination flaw. Several small die breaks can be seen as dots, as between the O and the R in GEORGEIVS and in the V and between the V and the S.
The reverse displays a ten string Irish harp toped with a crown ending with a six pointed star while below on either side of the base of the harp is a decoration known as a six petal rosette or sixfoil. Several very small die breaks are visible. Most notably near the rim below the rosette on the left. 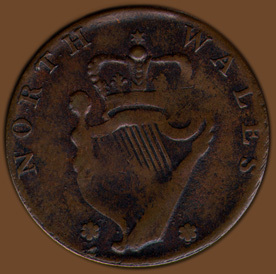 Smaller breaks, seen as dots are visible on either side of the base of the harp and in the legend just after the N and between the O and the R and between the T and H in NORTH, another noticeable break is slightly above and to the right to the star on the crown. 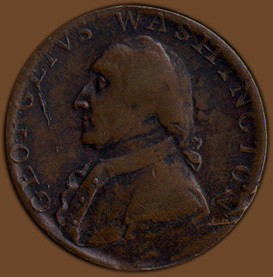 Most commentators state this coin is rarely found in higher grades. Provenance: Acquired through the Robert H. Gore, Jr. Numismatic Endowment from EANA auction of November 1, 1997, lot 608. Comments: Listed by Fuld as WA.1793/2.1 and by Dalton and Hamer as, Middlesex, Political and Social Series, no. 1051. This example uses the obverse die from the Washington Small Eagle Cent (Baker 15) but the letters were recut in the die. Note that these letters usually have straight serifs but on Baker 15 the serifs are frequently curved with a notch in the center. This example is a late state after the dies clashed. The reverse is buckeled with the rim area at "HALF" in the legend curved inward. 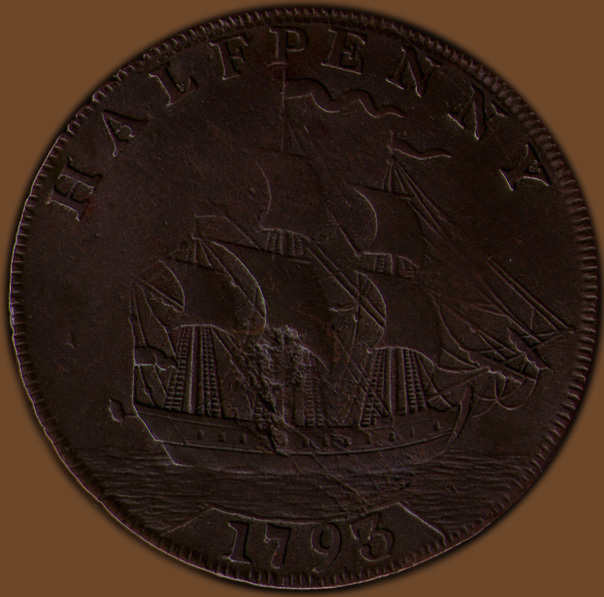 Also the overdating is not apparent; as Breen states, the overdating 1793/2 cannot be seen in examples after the dies clashed. This example also had a planchet void and a few fissure cracks at the bottom of the central mast.